.Cxj. For to make flampens. & thenne serve hem forth. This recipe is the earliest I’ve found. The other recipe in the same manuscript corroborates what this says, that the coffins are made without water. It’s striking that the coffin recipe has no water in it. Looking through the recipes the first one that actually mentions water isn’t until 1450. However there are many without eggs. I had previously assumed that water would be added unless otherwise stated, but as the two recipes in this book are so close as to be referring to the same thing I suspect that in at least this book the coffins are made without water. By not using water in the crust you decrease gluten development and the shrinkage of the pastry, which if you’re planning on sealing it would be a good thing, as shrinking could cause the pastry to crack. Also, too much gluten would result in a tough pastry. The occasional modern pastry crust will use egg yolks or sour cream instead of water to make the pastry more tender. Egg white also can cause toughness, though this recipe does not specify whether to use the yolks or whole egg. Between the use of sugar, eggs, and the lack of water I suspect that this crust is designed to be eaten. It should make a tender and tasty crust. However, because I haven’t seen pepper appear in any of the other recipes, and there is no reason for eggs to be named twice if everything is going together I’m going to assume that the ingredients are just sugar, eggs, and flour. I suspect that the pepper, eggs, saffron, and salt is for another part of the dish, though it never seems to be mentioned, unless that is the egg wash it says to use as a colourant (likely as the use of saffron seems to be primarily as a colorant). I have made a major departure from the original here, and that is that it doesn’t look like the original was blind baked, to bake without filling. It may have been, as many coffins are, but the recipe does not explicitly state that. I chose to blind bake this more for the sake of having two easily comparable items rather than out of any belief that it must be blind baked. The dough this produces is heavy and thick and would likely be easy to form into various shapes even without prebaking in a form. It is possible to cut it into shapes, prebake, and then form it together with flour paste. Once baked it holds its shape very well. It is slightly fragile, but is thick enough that it won’t break easily. It tastes cookieish, which may be a sign that I added too much sugar to the egg, or that could be what it was designed to taste like, as the same dough is used to make small pellets for eating as well. I can easily see this as a very versatile pastry case which could be formed into any number of shapes. It is easy to make and has a very delicate flavour. I feel confident in saying that someone ate this. It may be similar to trenchers in that the rich would pass the coffin off to an almoner later for distribution to the poor, but I see no reason to think that this would not have been eaten. Again we have a recipe that doesn’t call for water. However because this is after the time where many recipes call for at least a sprinkling of water in the coffin dough I suspect that it wouldn’t be amiss if a little was added; though I’m going to try to avoid it. Egg yolks have two of the parts needed for pastry, liquid and fat. The addition of butter to this should make for a very tender pastry. The fact that this coffin has the option of adding sugar or saffron implies that it is also to be eaten, though I am not adding sugar to my version. When I made this coffin I noticed a few things. It was heavy, but flaky. It also bubbled more than the other coffin. For the final version I will be weighting the crust. I also found that the crust was a little oily right out of the oven, but that ended quickly. I also found the crust to be tougher than the earlier one, which is exactly the opposite of what I had been expecting. I suspect it may have something to do with the butter being melted. But at the same time this coffin feels like it would hold up better to fillings with less prebaking. It also rolls out easier, and so would let me do more fanciful things with it. Eggs: modern eggs are probably not dissimilar enough from the eggs that would have been used in the fourteenth or sixteenth century. Sugar: I will be using standard refined white sugar instead of the partially refined sugar they would have used. Sugar was widespread in western Europe by the middle of the fourteenth century, and was being refined, though not as much as our sugar is today. In England sugar was being sold for 7d/lb by 1334 and continued to drop. Flour: they would have used a soft wheat flour, stone ground, and boulted (for the sixteenth century coffin it was likely boulted to its finest). Instead I will be using a combination of all purpose white and whole wheat (3:1), which is a close approximation of the amount of bran left in the flour. The disadvantage to using modern North American flour is that it has a higher protein and gluten content, which will make the dough tougher. I have found a source for whole grain soft wheat and am planning on using it in my next attempt, but did not have time to get it and boult it for this project. Butter: I am using unsalted sweet cream butter for this. Again, similar to eggs there have been many changes in butter over the centuries, but I do not think that they are enough to warrant much change. Baking: I am using a standard conventional oven for my baking, and using a stoneware pie plate as my form. They would likely have used pottery forms, and would have used a bread oven. Because the recipes do not use water I suspect that the steam which is needed to simulate the nature of a clay oven when baking bread may not have been as prevalent when baking coffins, and so I will not be adding steam to the oven. Both coffins seem designed to be eaten, as they are tender, delicate, and tasty; a far cry from the tough salt laden versions that most modern redactions seem to be. The lack of water does seem to make the pastry more tender. There was little shrinkage of the dough, just enough for it to pull away from the sides, and no cracking. The fact that two hundred years apart the coffin recipe is essentially the same leads me to believe that this may have been the standard coffin, and that other versions are derived from this. There is the occasional hot water pastry described, but I suspect that for the most part this edible version was common. I think that I have dispelled a few myths in this project. The coffin is not tough, it is not tasteless, nor does it taste bad, and it was likely eaten. The two coffins are similar enough as to show a baseline for what coffins were. I look forward to examining the divergences from it, but for now I feel that I have found an adequate version of the Coffin for me to use in future endeavors. Though I have heard before that water would have been assumed to be in the recipes so it didn’t need to be stated, I believe that instead water was actually assumed to be absent unless explicitly stated. And most importantly I believe that cooks in the fourteenth through the sixteenth centuries were quite knowledgeable about what made a good pastry, as shown by the creation of these coffins. I may be using them in my modern baking as well now. I would like to investigate this topic more, looking at descriptions of the coffins from beyond the cookery books to see if they corroborate my findings. I also plan on experimenting with more coffin recipes and seeing how they relate to these two. A.W. A Book of Cookrye. Translated by Mark and Jane Waks. London, 1591. Austin, Thomas, ed. Two Fifteenth-Century Cookery-Books. London: Oxford University Press, 1888. Brown, Amy. Understanding Food: Principles and Preparation . Toronto: Thompson Wadsworth, 2008. Dawson, Thomas. The Second part of the good Hus-wiues Jewell. London, 1597. Frere, Catherine Frances, ed. A Proper newe Booke of Cokerye. Cambridge: W. Heffer & Sons Ltd., 1913. Hammond, P.W. Food & Feast in Medieval England. Stroud: Sutton Pub. Ltd., 1993. Huguenin, Jehanne de. Medieval Pastry. 2005. http://www.3owls.org/sca/cook/pastrycase.htm (accessed October 2, 2010). 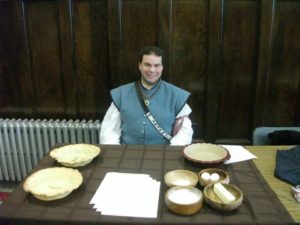 “Medieval And Tudor Flour.” Historical Foods. http://historicalfoods.com/5098/medieval-and-tudor-flour/ (accessed October 5, 2010). Myers, Daniel, trans. Fourme of Curye. Manchester: John Rylands University Library, English MS 7, 1390. —. “On the Size and Color of Eggs.” Medieval Cookery Blog. October 8, 2008. http://medievalcookery.blogspot.com/2008/10/on-size-and-color-of-eggs.html. Napier, Alexander, ed. A Noble boke off cookry for a prynce houssolde or eny other estately houssolde. London: Elliot Stock, 1882. Strassburg, Delbert von. “Pyes de Pares.” Cockatrice: The Lochac Arts and Sciences Magazine, no. 21 (2006): 2. Delbert von Strassburg, “Pyes de Pares,” Cockatrice: The Lochac Arts and Sciences Magazine 21 (2006): 2. “Medieval Pastry,” Jehanne de Huguenin, accessed October 2, 2010, http://www.3owls.org/sca/cook/pastrycase.htm. Thomas Austin, ed., Two Fifteenth-Century Cookery-Books (London: Oxford University Press, 1888), 74. A.W., A Book of Cookrye, transcription. Mark and Jane Waks (London, 1591). Daniel Myers, transcription, Fourme of Curye (Manchester: John Rylands University Library, English MS 7, 1390), f55r-f55v. Catherine Frances Frere, ed., A Proper newe Booke of Cokerye (Cambridge: W. Heffer & Sons Ltd. 1913), 29. Alexander Napier, ed., A Noble boke off cookry ffor a prynce houssolde or eny other estately houssolde (London: Elliot Stock 1882), 52. “coffin, n.2” Oxford English Dictionary, 2nd ed. 1989. Amy Brown, Understanding Food: Principles and Preparation (Toronto: Thompson Wadsworth, 2008), 468-469. Thomas Dawson, The Second part of the good Hus-wiues Jewell (London, 1597), 16. Daniel Myers, “On the Size and Color of Eggs,” Medieval Cookery Blog, October 3, 2008, http://medievalcookery.blogspot.com/2008/10/on-size-and-color-of-eggs.html. ” P.W. Hammond, Food & Feast in Medieval England (Stroud: Sutton Pub. Ltd., 1993), 10. “Medieval And Tudor Flour ,” Historical Foods, accessed October 5, 2010, http://historicalfoods.com/5098/medieval-and-tudor-flour/. Hiya, I was pointed to your blog by a friend as I am currently interested in pastries for raised pies, in particular the types of flour used. I have tried to access the article “Medieval and Tudor Flour”, Historical Foods, your footnote 21. Unfortunately the link no longer seems to be valid. Can you direct me to a current link, if not is there any chance you might have kept a copy of the article on record. Looking at it it seems their whole website went down. That’s unfortunate. Hopefully it will be back up and running in a few weeks. If you’re looking for the correct type of wheat I have this to help you. According to L’agriculture et maison rustique you plant wheat at the end of September and harvest it in July. That means that we’re dealing with winter wheat, likely a Beardless Winter Wheat (T. hybernum) if Carl Linnaeus’ taxonomy is to be trusted (and I don’t know if it is) as that’s the only Winter Wheat he lists. Putting that together with anecdotal evidence that they would primarily have grown soft wheat (apparently one of the reasons why the English switched to growing wheat in Canada was that the soil here was better for the higher gluten hard wheat) I would go with a Soft Beardless Winter Wheat (and I don’t know if it would be red or white wheat). I will have a look round here in the UK and see what I can get, there are a couple of mills that sell stoneground English grown wheat direct to the public and would probably be able to tell me what sort of wheat they are selling. The other alternative I was thinking of was trying Spelt as it is lower in Gluten than modern wheats and it would appear that the type has remained pretty consistent in Germany (the main source for much of the seed grain) as it has never gone out of production. It is not only used in long fermentation and sourdough breads but also as a whole grain in certain dishes known as Auflauf – grain is known as Dinkel. They also use it to make something called Gruenkern which is made from parched green spelt which is used for a Auflaufen and something called Fraenkishe Gruenkernsuppe which is a light soup thickened with cracked Gruenkern. Pearled Spelt is now available here in the UK and makes a good furmenty. Spelt is a good idea. I’ve used it for some Apicus recipes and it seems to work well, though I haven’t used it for any of the later recipes. Reference 1. Cockatrice has undergone several changes of management over the years, and they no longer have any of the early issues on their website. The only information they have on this issue is the issue number; they don’t even know when it was published. At least one other version of it is out there on the ‘net, as I have a .pdf of the article that is formatted differently from the Cockatrice version. It didn’t credit a publication, nor did it name the author. Pyes_de_pares.pdf was the file name under which I found it. While the formatting differs, the intellectual contents are identical. Foolishly, I didn’t keep track of where I downloaded it from, which was the cause for my search which led to this article. I’m much better now, I have multitudinous documents filled with URLs for where I’ve found things. Thank you so much. I appreciate the update.